Is There a Better Individual Season of Doctor Who Than Tom Baker's Debut? It feels like it’s been approximately 300 years since Doctor Who was last on the air, which has got me thinking about the classic show while waiting for the arrival of Jodie Whittaker’s new Doctor. And between Twitch’s ongoing marathon and its impending arrival on Blu-ray, I’ve been thinking: Tom Baker’s first season is bloody good. The 12th season of Doctor Who (not to be confused with, err, the season that should air in 2019 after Jodie Whittaker’s debut in season 11 later this year) marked a big sea change for the show. Jon Pertwee’s tenure as the third Doctor had largely been confined to earthbound adventures, with a story decision to have the Time Lords forbid the Doctor to use his TARDIS lingering from the end of Patrick Troughton’s run. The era had seen Doctor Who become much more of an ensemble show, with the Doctor supported not just by his usual companions, but also a cast of regulars who were part of UNIT, a military and scientific research group whose job it was to safeguard Earth from alien threats. But the show was getting ready to move on from that scenario (the Doctor had already been freed from his exile in the later parts of Pertwee’s run), and truly back into time-bending extraterrestrial adventures with its latest Doctor, who would quickly develop a desire to not be pinned down by his prior duties with UNIT. But this sea change — a shaking up of the status quo, a new Doctor, and even an extra companion in the form of Harry Sullivan, a young Navy doctor — lends more to making season 12 exciting to look back on in a historical aspect rather than a qualitative one. With the gift of hindsight we know that this is the beginning of a new era for Doctor Who—not just the formative years of one of the most beloved incarnations of the Doctor to have existed, but the beginning of an era that would see the series reach popular highs unlike anything it would arguably see again for decades. Noah undergoing the disgusting transformation into a Wirrn. Who knew bubble wrap could be so ghoulish? There is so much more to season 12 than just its important place in Who’s historical context, however. This run of stories — “Robot,” “The Ark in Space,” “The Sontaran Experiment,” “Genesis of the Daleks,” and “Revenge of the Cybermen,” all loosely connected as one continuous arc of adventures but mostly standalone—offers a masterclass in everything great Doctor Who should be, from the variety of its settings to the quality of its villains, and from its range of tones to the themes it tackles. There are some ups and downs, but then again, that’s also part of the ramshackle essence of what Doctor Who is. “Robot” isn’t just about the changing of the guard between Pertwee and Baker’s Doctors (and even eras, as the last serial produced by Barry Letts before the new producer for the series, Philip Hinchcliff, joined for “The Ark in Space”), but a breathless, action-packed romp where it’s hard to tell if the greater anarchic force on screen is Baker’s newly regenerated Time Lord or the titular giant robot. “The Ark in Space” is Alien before Alien existed—on a ‘70s BBC budget, of course — a terrifying take on Who’s beloved base-under-siege trope with a truly gross foe in the insectoid Wirrn. Sarah Jane is subjected to Styre’s cruel tortures in a rare classic Who two-parter. 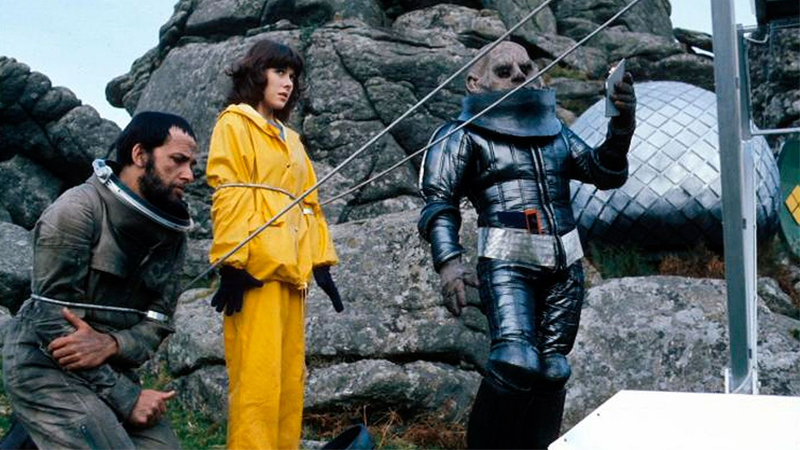 “The Sontaran Experiment” is a weird, experimental two-parter that splits up the TARDIS trio in some interesting ways and shows a crueler, darker side to a Who race that’s usually played a bit more straight-laced. 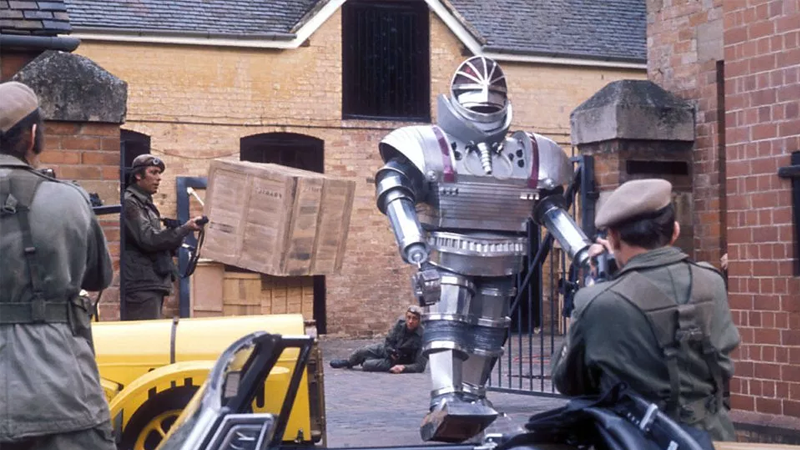 “Revenge of the Cybermen,” perhaps the weakest link of the season, marks a long-awaited return for Doctor Who’s perennial second-favourite baddies, a story that gives the Cybermen their wonderfully silly weakness to gold. Like I said, ups and downs, but even in its bumps along the road, season 12 encapsulates the sort of adventures Doctor Who thrives on, balancing the fear and fun that would give the show its infamous reputation for sending kids scurrying behind their sofas. You’ll notice, of course, that I didn’t mention one story in particular, because “Genesis of the Daleks” — one of the greatest origin stories of all time, and one of the greatest Doctor Who stories ever made, even now—deserves a special highlight. 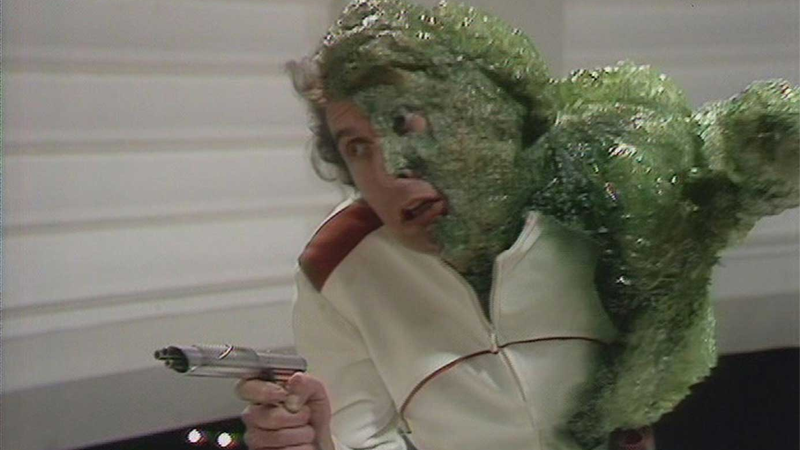 “Genesis” is, like others in this season and later on in Hinchcliffe’s tenure, brutally atmospheric, finding equal terrors in the radiation-doused horrors of war on the Dalek homeworld and the unsubtly Nazi-inspired society of the Kaleds, their progenitors. In Davros, who makes his debut here, the Daleks are given a face — a personality that a metallic pepperpot could never truly have beyond its shrieking cries of “Exterminate!”, and one that serves to only make them all the more terrifying beyond their sheer, all-consuming hate, by presenting the broken man and broken society behind that hate. Then there’s the other side of “Genesis” that elevates it to an all-time masterpiece, and its questions of ethics and morality — not just Davros and the Daleks’ moral codes, but even that of the unquestionable Doctor himself. Tasked by his own people of stopping the Daleks from ever having existed, the serial’s most famous moment is the Doctor, hesitant to tap the wires together that could end his most evil enemies, asking a simple question: “Do I have that right?” That, and the ensuing debates between the Doctor and Davros as he desperately attempts to convince the scientist not to go through with his awful plans, strike at the very heart of what Doctor Who is about, underneath the veneer of rubber-suit aliens and a blue box that’s bigger on the inside. Season 12 would be a damn good run of Who without “Genesis,” but with it? It becomes remarkable. There are other seasons of Doctor Who, classic or new, that have a bolder variety of stories, perhaps even some that have individual stories that are stronger than what season 12 offers. But as a single slice of the gigantic, timey-wimey pie that represents all that is good about Doctor Who, it’s hard to find a better, unique sample of what makes this all such a delightful adventure in time and space in the first place.